Meals on the eve of Yom Kippur are meant to fortify Jewish families for a day of fasting and praying. In the Berrie house, the meal is marked with what Scott Berrie calls “yellow chicken,” a Moroccan family recipe for chicken in a lemon sauce, served with zucchini and egg noodles. “He’s madly in love with that dish,” explains his mother Kathy. “It’s not that complex [or] hard,” Scott explains. 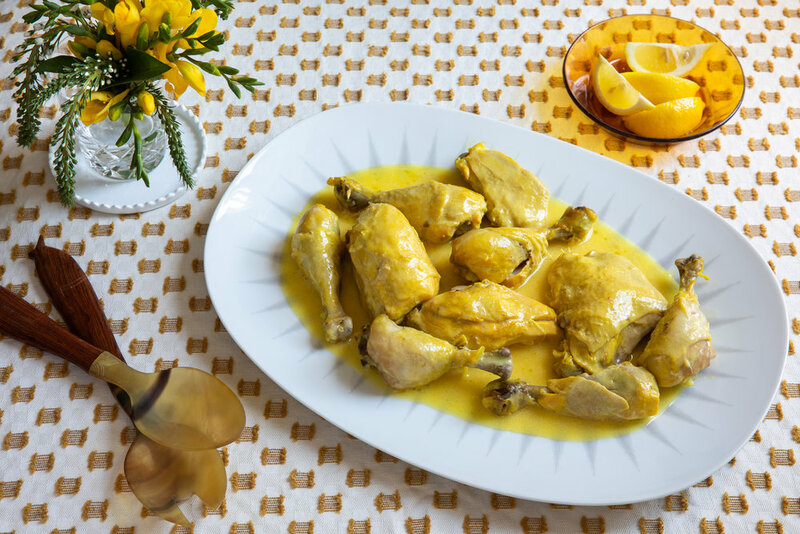 “But it takes a lot of patience and very subtle skill to make it just right.” Add the lemon and eggs, which enrich the sauce, to the chicken too early and the mixture will curdle, but add it at just the right moment and it will create a velvety yellow sauce. “What I love the most is the color,” Scott adds. It’s a recipe Kathy and her mother Fiby brought with them from Morocco to North America, when they moved more than 50 years ago. Growing up in New Jersey, Scott remembers his mother preparing the dish before the fast every year. He would watch from the sidelines. “She had her way in the kitchen, so I didn’t want to interfere,” he explains. Now a parent himself, he’s tried to recreate his mother’s recipe at home. He’s never quite replicated his mother’s version, but he’s gotten closer and closer over the years. 2. Season the quartered chicken and legs with salt. 3. Heat the oil in a large heavy bottomed pan over medium heat. Add the chicken, cover and cook for 10 minutes. Add the garlic and saffron water. Bring to a low simmer, cover, and continue to cook for 90 minutes, until chicken is tender and falling off the bone. 4. Remove from heat and let cool for about 15 minutes. 5. Meanwhile, in a small bowl, whisk together the egg yolks and lemon juice until combined. 6. Add the egg and lemon mixture to the chicken. Lift the pot and swirl several times until the sauce comes together and is uniform. 7. Serve immediately with egg noodles, ladling sauce over the top.